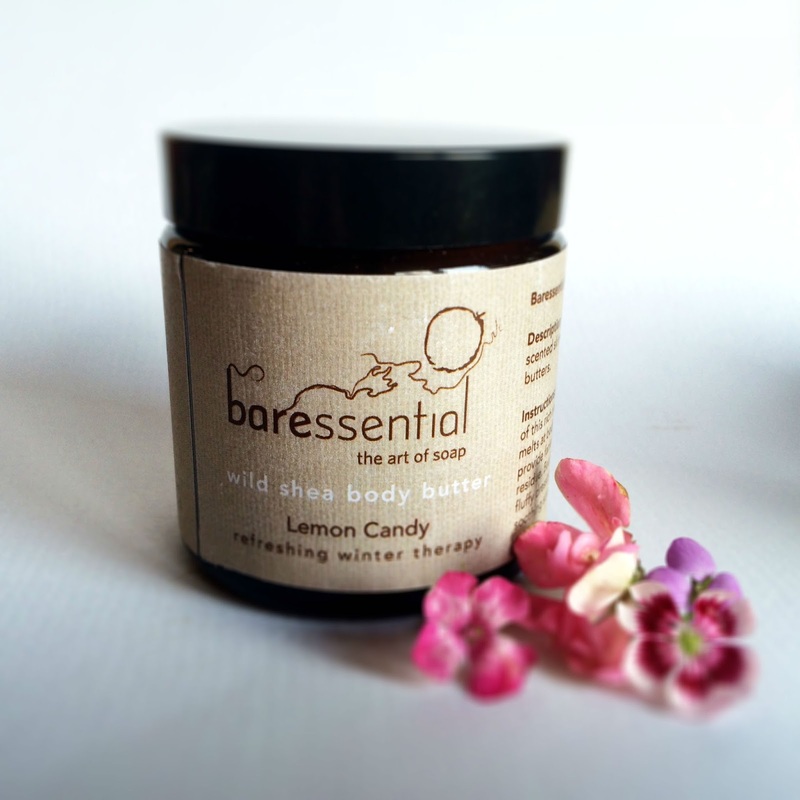 Baressential Product Review, natural and organic for body and face. We have been friends with Kate and Andrew of Baressential for many years and have been using their gorgeous soaps since they began to make them. Not only are they made from natural ingredients and ethically produced, they smell incredible and look stunning too. Which isn't surprising really, given Kate's artistic background. Her eye for colour and beauty is evident in the vibrant, swirling hues of the soaps. Recently they have been developing a range of body and face products - I had already tried a couple at the testing stage and loved them so I was very happy to get the products below as a little present and to be able to share with you how much I like them. All our soaps are vegetarian friendly"
If you like anything Rose scented, this is definitely for you! The smell is incredible, one of my favourites. It is described as 'An uplifting and deeply cleansing facial polish carefully designed to exfoliate revealing smooth, toned and enriched skin'. The texture is quite thick so I found that I only needed a very tiny amount to get a good effect. It's incredibly gentle - my skin is quite sensitive and scrubs can either be way too harsh for me or completely ineffective. This is just what I like in a scrub, a feeling that my skin is being exfoliated without being irritated. I also particularly liked that it leaves a slight layer of oil on the skin - my face felt really soft afterwards and it was a great extra layer of moisturisation which is ideal for me as my skin tends to be dry. This is definitely a product I would buy, it has a bit of a luxury feel to it, the list of ingredients even sounds lovely with things like Bulgarian Rose, Jasmine and Geranium. Apart from the gorgeous name, the selection of ingredients sounds equally delicious - from Fair-Trade Ghanian Shea Butter, to Vitamin E to Therapeutic Essential Oil Blends, all evoke a natural indulgent luxury that any skin would benefit from! The texture is firm but melts at body temperature and glides over the skin, absorbing easily. It leaves a fabulous lemony fragrance and moisturises without leaving a greasy residue. I'm finding this particularly brilliant for problem areas like knees and elbows and also I've been rubbing it on my nails and cuticles because of its softening effect. The description reads: 'Smooths and enriches for toned, beautifully soft, supple skin'. Like the Rose Face Polish, the scrub texture is great - rougher than the facial scrub obviously as it's for the body. It's brilliant for all the dry areas like knees, feet and elbows and it leaves the skin soft and ready to absorb the body butter for super soft effect. I've been using it on my hands too, as they're usually sadly neglected and the oils are really good at reversing some of that neglect by giving them much needed moisture. It contains Coconut Seed Butter, Coffee Arabica Seed Oil, Fair Trade Cane Sugar and a gorgeous blend of essential oils which give it the lingering delicate fragrance. *Note - The prices above are promotional only and these products will be available from the Baressential online shop which should be up and running from March 30th. In the meantime, if you are interested in purchasing any of the above, you can contact Kate directly at kate@baressential.ie. Hope you have enjoyed my review, if you can recommend any products, do let me know! Oh I bet you these smell amazing! I love these kind of handmade, organic beauty products! They always smell so nice and the scent lasts a long time! These products sound amazing. As someone with SUPER sensitive skin it's great to see these products are organic. That Shea butter looks like magic. I'm certain these would be absolutely fine for you to use, and would definitely be cruelty free but you could email Kate if you wanted to double check, they really are gorgeous products! The rose face polish sounds absolutely divine. Anything that smells of roses is up my street! I love homemade products and rose scented would definitely be my favourite. Looking at the packaging and the ingredients I think the price is totally worth it. Wow this looks amazing. I was not aware about this before. Thanks for sharing it with us. Oh these products sound lovely and I love how natural everything sounds. I really want to try the rose face polish and lemon candy shea body butter for myself! Love rose sented beauty products !! Laci. Its always great to see some ethically produced beauty products, and you're right. Those soaps look so pretty! This product sounds amazing. Will check this out. These products look amazing, would love to try them. Especially the scrub.